Today was actually a day I kind of dread. Pushing for MBC instead of Deurali, 6 hrs vs 4 hrs and huge increase in the altitude by 1,100m. It goes like this -- Dobhan - Himalayan - Deurali - MBC, 2 hrs each. The initial plan was to trek to Deurali, and a short one due to potential risks of altitude sickness or known as Acute Mountain Sickness (AMS). Kenn wanted to push for MBC, so that the next day he can reach ABC early and climb the ridge to 5,000++ m as recommended by Tim of BOAC. Gulp, i opposed to it initially for fear I will be hit with AMS. We started early at around 7am. It got more and more tiring because of all the uphill and the air was getting thinner. From Himalayan on to Deurali we passed by Hinko cave at 3,100m. 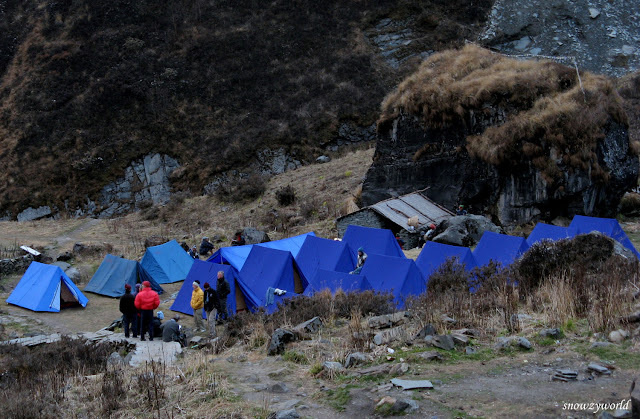 In the past when there's no lodges, trekkers will set up tents here. This stretch of trail seems to be most subject to avalanches. 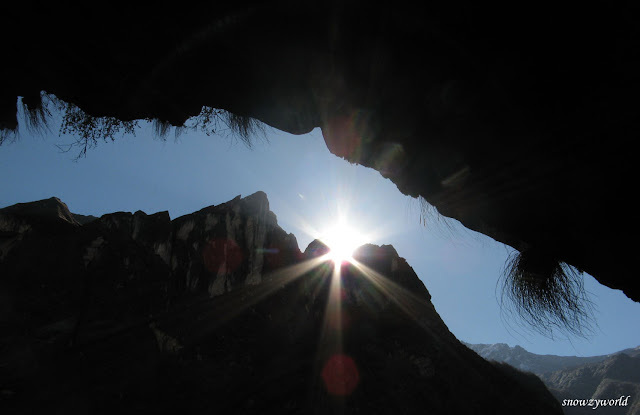 From Hinko cave, Maila pointed to me Deurali. So near yet so far away.. 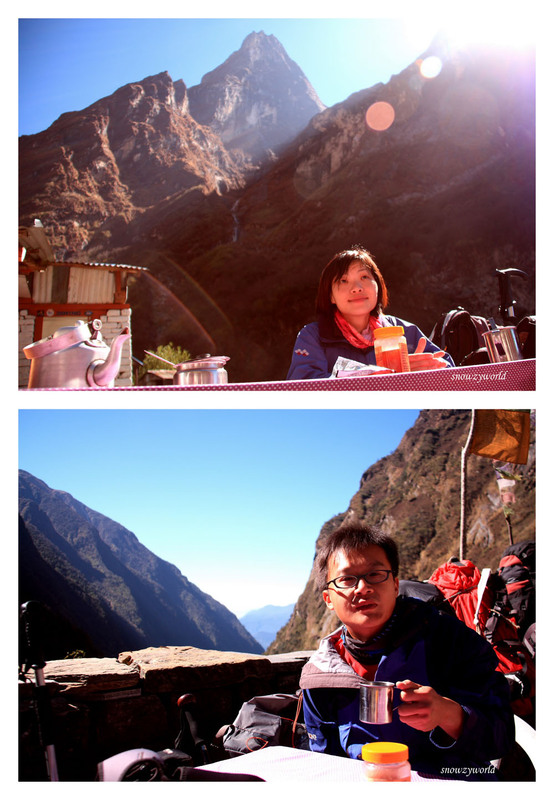 When we reached Deurali, it was only about 10:30am! Gosh! If we really stayed in Deurali for the night, it will really be quite a waste of time. Just another 2 hrs, we will reach MBC! We saw a group of trekkers being shocked that it's still so early but they can't continue on as the lodges at MBC were almost booked out. We took a coffee break here for about 30mins. Maila, although had called the lodge at MBC in advance to book a room for us, but was still not secured. So he told Kenn to "run" or rather walk faster with WJ to arrive at MBC early to show face so as to secure the room. I guess Maila must have seen Kenn behaving like a Duracell rabbit today thus coming up with this idea. Brilliant! Than I will not be so stress, I can walk slowly to MBC. Yes, set! Kenn "vanished" to nowhere while me and Maila started our slow trek to MBC. It was quite demoralising for me. I can feel my soul already diminished into thin air, my body like a zombie.. just walk and walk. It's nepali flat all the way to MBC, no major uphill. Guess the air is getting thinner thus the zombie feel. I asked Maila "How long more??" "1hr or so more..." I saw a lodge across, I asked Maila eagerly, "Is that MBC??" grinning,... "Nope, it's after this, probably another 20-30mins more." *Sigh* I gave up asking anymore, just continue walking like there's no end. Than I saw cluster of lodges (there's 4) than I saw Kenn (who reach almost like 45mins before me!!!). Yeah!!! finally!! after 2hrs of almost endless walking, finally I can rest and eat the pipping hot fried rice and soup which Kenn had ordered when he reached, yummy so delicious especially after a hard day of walking. This round our room was cramped with 4 single beds. Shower now don't come free, charged NRp150 per person, you pay another NRp100 for heater in the dinning room. 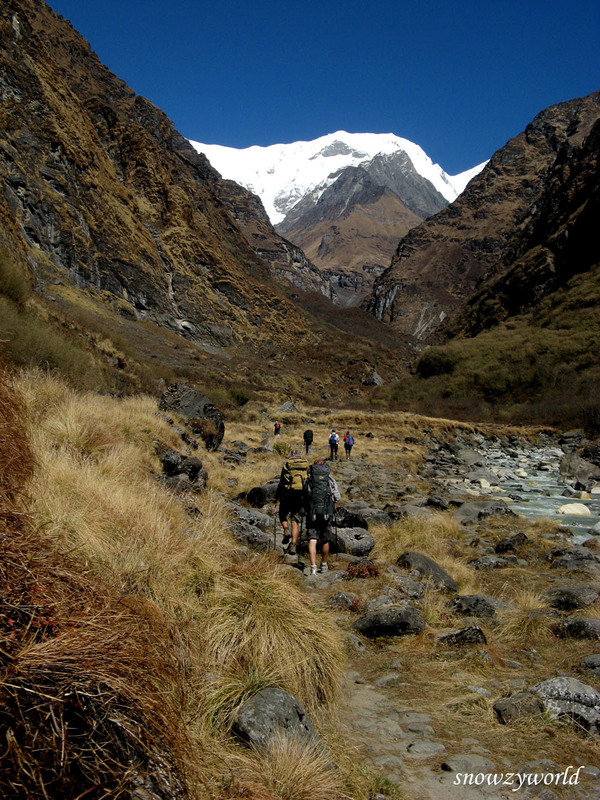 But you are now closer to the Annapurna mountain range, you started feeling the real cold here. Tried to shower, but after barely decently shampooed my hair I gave up the shampoo and soap, just water over my body to rid of the stickiness from perspiring.